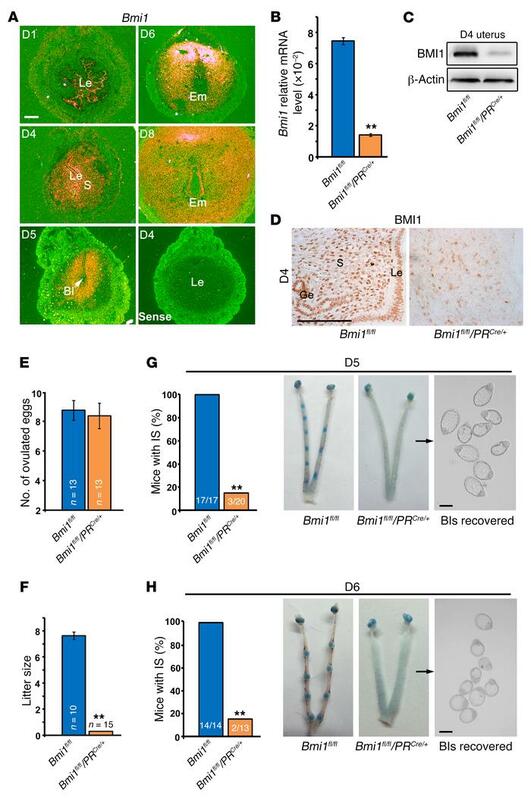 Uterine-selective depletion of Bmi1 results in embryo implantation failure. (A) In situ hybridization analysis reveals a spatiotemporal expression of Bmi1 in mouse uteri on days 1–8 of pregnancy. White scale bar: 100 μm. (B–D) Quantitative real-time PCR (B), immunoblotting (C), and immunohistochemical analysis (D) of uterine Bmi1 mRNA and protein levels in Bmi1fl/fl and Bmi1d/d uteri on day 4 (D4). The values are shown as the mean ± SEM (n = 3). Black scale bar: 100 μm. (E) Number of ovulated eggs in Bmi1fl/fl and Bmi1d/d mice. Number within the bar indicates the number of mice tested. (F) Average litter sizes of Bmi1fl/fl versus Bmi1d/d females. Number within the bar indicates the number of mice tested. (G and H) A large portion of Bmi1d/d females exhibit implantation failure recovered with morphologically normal blastocysts upon flushing the uterine horn on days 5 (G) and 6 (H) of pregnancy. IS, implantation site. Number within the bar indicates the number of mice with implantation sites per total tested mice. Data represent the mean ± SEM. **P < 0.01, independent-samples Student’s t test. Bls, blastocysts; Em, embryo; Ge, glandular epithelium; Le, luminal epithelium; S, stroma.